I hope everyone is having a nice week! 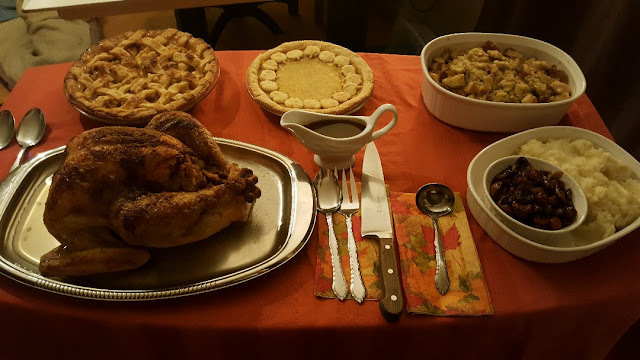 We had our big Thanksgiving Day yesterday and I went all out with the food! So much so that my body was aching last night from being in the kitchen all day, but it was so worth it! 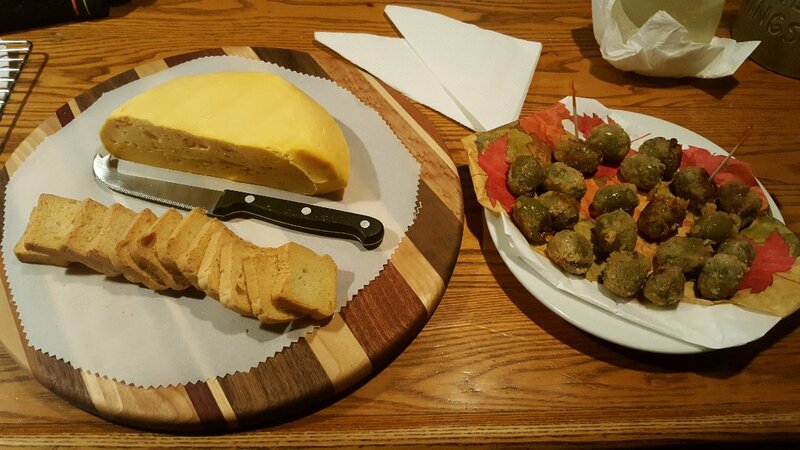 For an appetizer, I made my Fried Stuffed Olives with Blue Cheese and we opened the Colby cheese that I'd made in August. The olives were fantastic but the Colby was a bit sour at the finish. I'd read the same thing on the Cheese Forum, a few other people who used the New England Cheese Making Company's recipe were also disappointed. Oh well, it's not bad, just not great. We'll still snack on it, but I hope my other cheeses are MUCH better!! The cheese may have been disappointing, but THIS was definitely not!! This was my first turkey dinner that I made completely from scratch! Well, you know, I didn't raise the turkey or grow the cranberries, but you get the point! I took Mama Pea's advice and went ahead to make some pumpkin purée from those little pumpkins - even though they weren't labeled "pie pumpkins". Worst case scenario was that the pie would have tasted icky. Far from it! 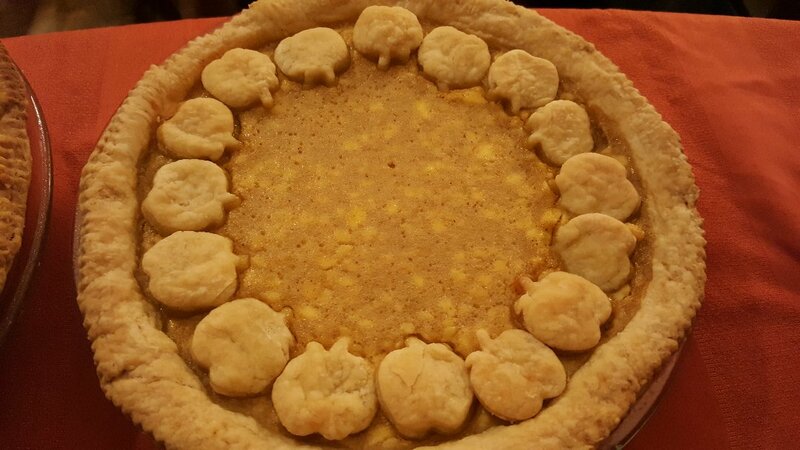 :) This was my first pumpkin pie from scratch! See my little pumpkin cut outs? :) I made the Creamy Pumpkin Pie recipe and oh my oh my...it was great. 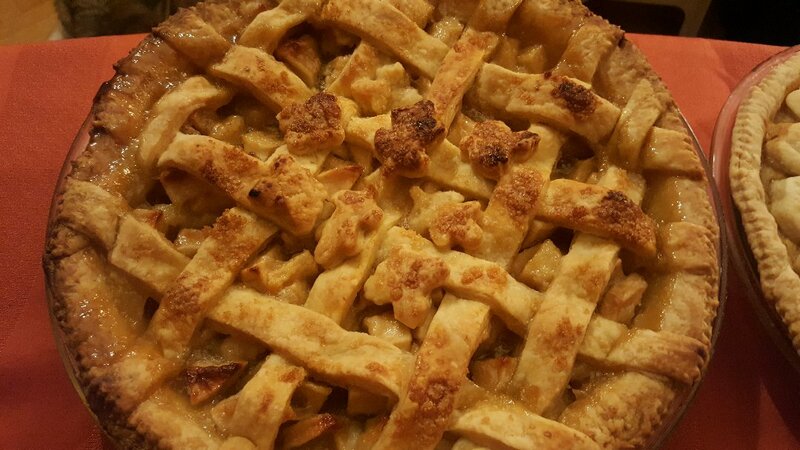 And because I wanted to feed my insanity have a back up pie, I also made an Apple and Pear Pie. I followed the recipe for apple pie, but I had some pears ripe, so I mixed them in and it tasted wonderful. We decided to open the "Cherry Bounce" that we made in July. Oh my gosh...it was so sweet and delicious! But it is made with Rye Whisky so it had a strong finish, it was a glorious surprise. 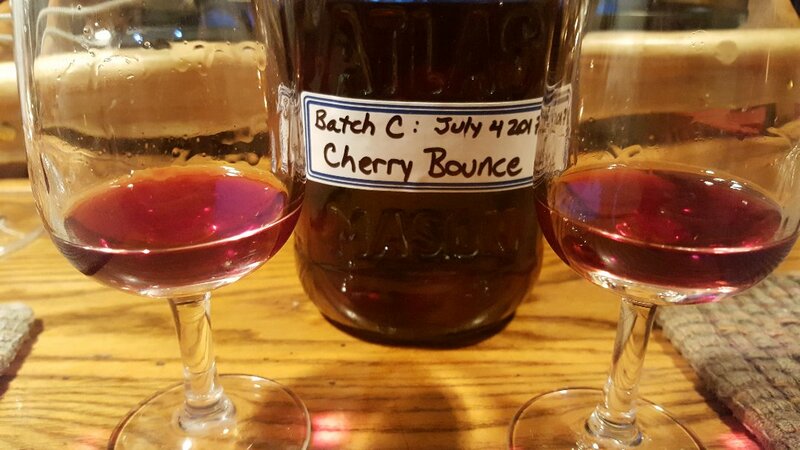 Next summer when the cherries are on sale again, we're going to load up and make a lot more of this bounce! My pal Susan made this as well, I wonder Susan, have you tasted yours yet? 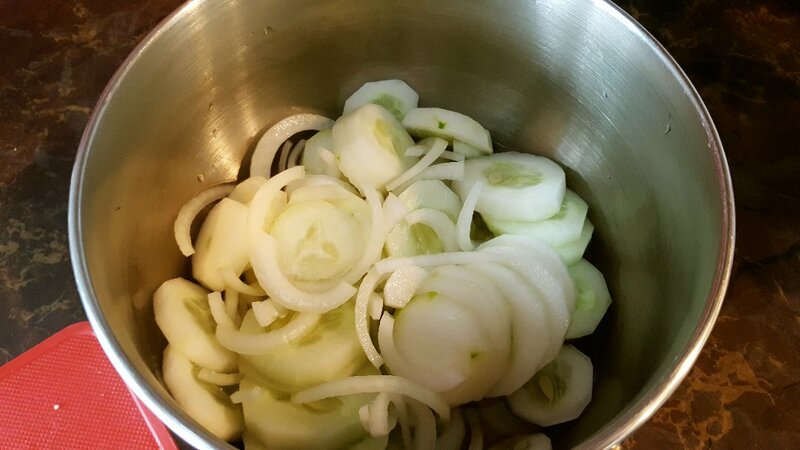 We had 5 little cucumbers left from the garden, but haven't been eating them too much, they taste a little bitter for some reason. 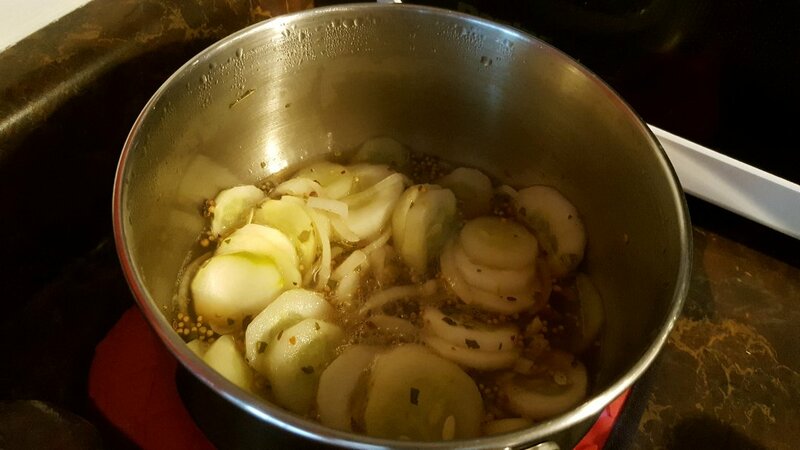 Anyway, I didn't want to compost them, so I made some quick Bread and Butter Pickles. We'll try these in a few days. Same thing with the cherry tomatoes...we have more than we can eat at the moment as the garden dwindles. 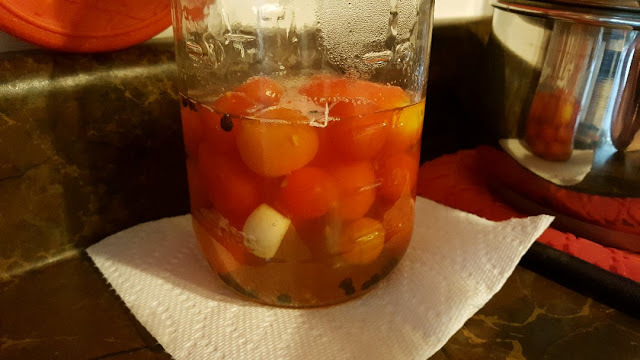 I found a recipe for Pickled Cherry Tomatoes...we haven't tried it yet, but I do hope they turn out yummy! Looks good huh? I made a tortellini with Spinach and Mushroom Sauce a few days ago. The sauce was excellent. The pasta, however, tasted like cardboard. Honestly...it was supposed to be a "gourmet" tortellini that we bought at the store. Alex is convinced they add shredded paper to the recipe...store bought pasta is now on my blacklist and I'll be making my own from scratch now. 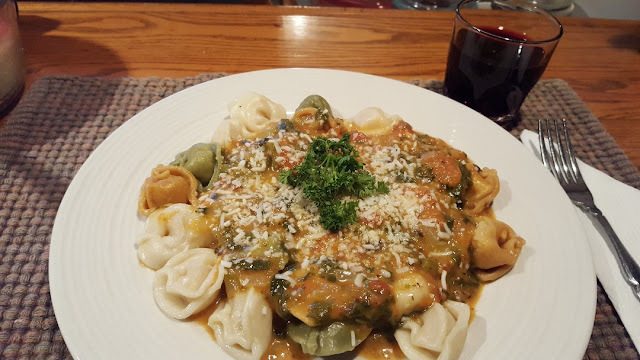 This tortellini was supposed to be filled with Ricotta - we couldn't even taste it! What's on your blacklist these days?? I think mine consists of nearly EVERYTHING now. Oh my, Rain that looks amazing! If I had not recently had breakfast this would have had me wanting food. I am sure that was a meal well enjoyed. Now I am hungry and envious, it all looks amazing and I will be looking at some recipes later. 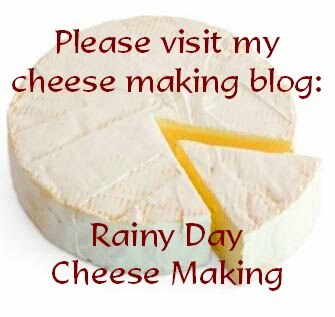 I haven't made cheese for such a long time and don't really have the space now. Pumpkin pie is a must have here, I have to search out sweet fruit as soon as it is in the shops. I watched Martin Yan years ago, his show was Yan Can Cook. He was a real clown but could really make it look easy. I started using a wok after watching his show. The food you manage to produce! The wonderful food you manage to produce! Sorry we didn't turn up at dinner yesterday. I had to stay home to do laundry and ironing. ;o) Hee-hee! Sorry the cheese was a bit disappointing, but I know you won't give up. I had a feeling the small pumpkins would be just fine for cooking. 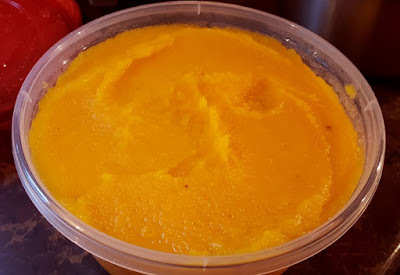 I'm currently wanting to try a pumpkin/ice cream frozen dessert to serve for Thanksgiving. 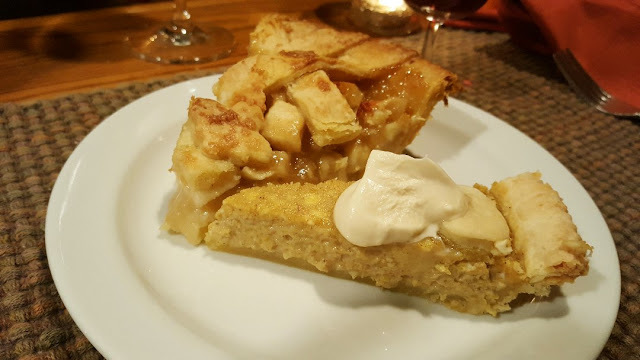 Haven't gotten around to it yet, but still have pumpkin puree in the freezer from last year's harvest (and some vanilla ice cream) so can do it. So, so happy to hear the dog situation is looking as though it's gonna be doable. The two new dogs are probably very happy, too! Thanks for sharing all the wonderful things going on at your house. What a wonderful meal! Nicely done Rain!! We had the "traditional" turkey dinner at the cottage. 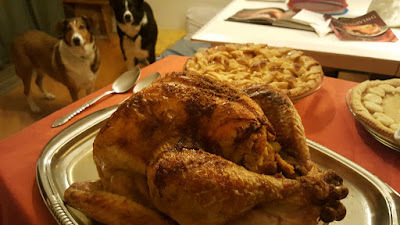 Although I am not a fan of turkey, its my least favorite meat, everyone else enjoyed it. My favorite is the pumpkin pie! :) This year's pumpkins, once Samhain is done, is I am going to cook them up, mash them and give them to the dogs. I am trying a little experiment with the dogs. Since their kibble is incredibly expensive ($130 a month) because of Hunter's issues, I am going to supplement their kibble with yogurt, eggs, blueberries, pumpkin, vegetables, etc. They won't get everything each day, but by mixing it up with their kibble I can try and hopefully save some money on food. Incredibly expensive otherwise!!! I have been doing copious amounts of research and apart from making their food, which I do not think will be cheaper, we will give this a go. 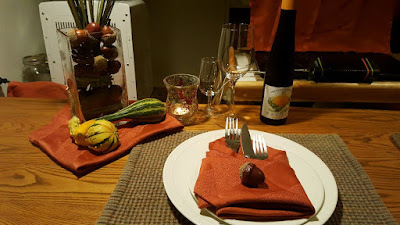 Your Thanksgiving dinner looked amazing!! I hosted at my place this year but did not make nearly as much. 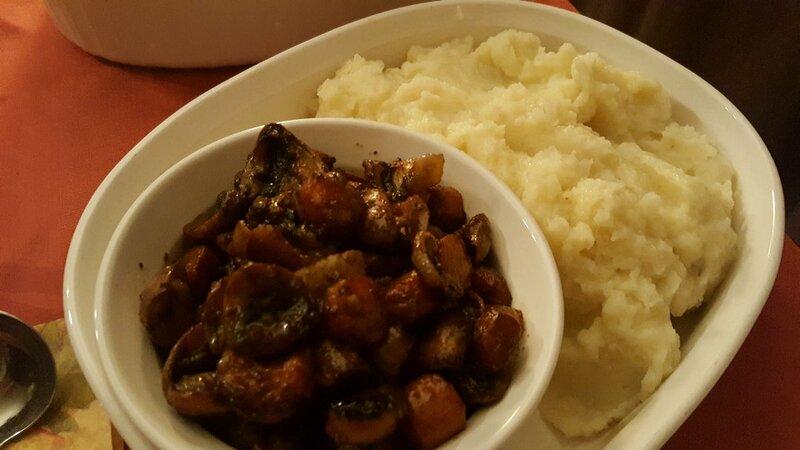 My B-I-L ended up doing the side dishes but I made my cranberry sauce and can take credit for preparing the turkey! I never understood why people used canned cranberry sauce when making it is so easy!! Many happy memories made all around! Your pies are so pretty. I'm sorry your cheese was sour. I have never had fried olives before. Your table was set wonderfully. Thank you for your recent visit. I was going to make a 3-layer cake but copped out because I was too tired. We've had so much chocolate cake these days, I'm caked out. Hi Pam :) I am really pleased about how my pie turned out! It'll be a must have here too from now on! Williams Sonoma has been a treasure for me for recipes. Everything turned out really well! Hi Gill :) I remember Yan Can Cook too! I had a wok many years ago, I'll have to check the thrift stores to see if I can find one now! Hi Mama Pea :)) Yeah, what happened? So laundry and ironing out-bid me huh? Well, your loss! ;) No, I definitely won't give up on the cheese. There was an inkling about that Colby recipe from other members of the cheese forum I frequent. They said the same thing about it having a sour finish. Oh I like the idea of the pumpkin frozen dessert! And thanks again for coaching me about the purée. I wasn't sure about it and now I'm so glad I tried...as I type this, the pie is all gone btw lol! Hi Dianna :)) Welcome back! Well, I'm sure you wished you could have stayed in the woods huh? I'm envious of your weekend! :) That grain-free kibble is insanely expensive. I used to feed our dogs a mix of ground pork, green beans and carrots, rice and egg shells, with some apple sauce. I LOVED making their food for them and they loved it too. It was more expensive, no doubt though. 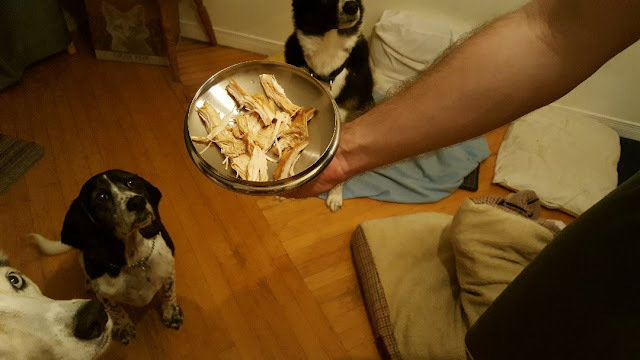 When Marlene developed bladder crystals we had to put her on that special $90 a month kibble so we just switched them all, but one day I would love to make them homemade food again. I hope your experiments work! Hi Stefanie :) Caked out lol...I think I'm pie'd-out. A three-layer cake is LOT of work. I think your desserts were fabulous and I'm sure your daughter agreed! :) The fried olives were really good. We don't have a deep fryer so I just pan fry them so I'm sure they could look prettier but the taste is nice. Very salty though depending on the olive you buy, you really have to soak them to get the salt out. 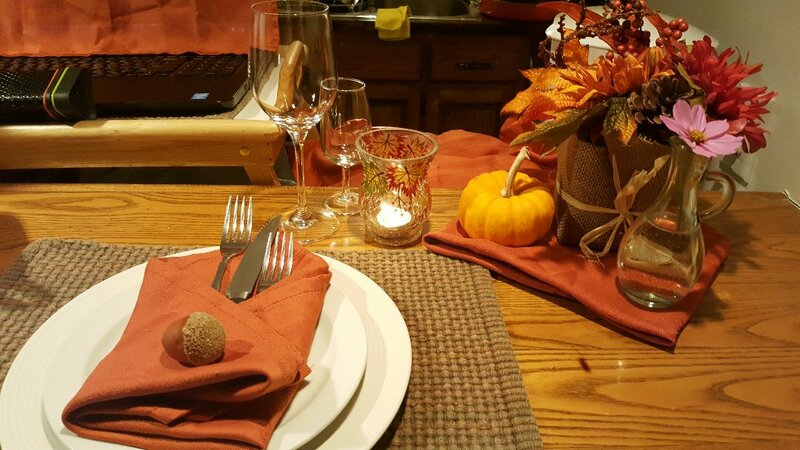 Your thanksgiving spread looks AMAZING and DELICIOUS! 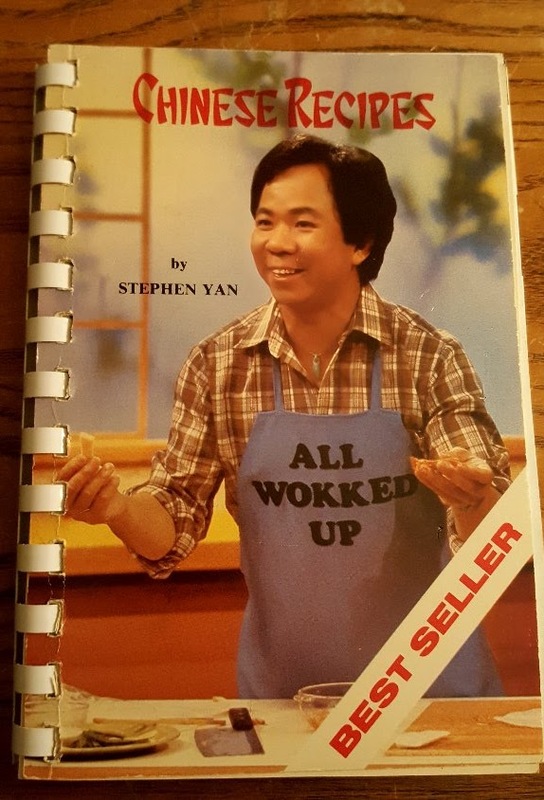 And yes, I used to watch "Wok with Yan" all the time! Actually, I'm thinking of buying a wok at the moment. My electric frying pan just doesn't cut it any more for stir fries. I may have to make cherry bounce next year, when cherries our fresh again. It sounds and looks pretty good. Your Thanksgiving meal looks so good! Thanks Debra :)) Funny how we remember these tv shows...I must have watched him as a kid when his show was on in the early 80's. I need to get myself a wok too, I have a frying pan, but it's not the same thing! Hi Kristina :) Thanks! :) The Thanksgiving meal was delicious and will be for the next week lol! The cherry bounce was SO good. I'm not usually into sweet too much, but we think of it more of a digestif. It's so sweet and fruity...but the rye lends it's flavour. It's so simple to make. It was an experiment this year, but next year it will become a staple when those cherries are on sale!! We saw one of the guys making it on the show "Moonshiners". He makes his with honey, but with 3 months of aging, it really doesn't need the added sweetener. His stuff was to be drunk un-aged. I am impressed. What a wonderful spread of food you served! I love the little pumpkins in the pumpkin pies. So glad that the dogs are working out. wow, wow, wow, wow, wow! You sure are a cook! It all looks so beautiful! Even your own Bounce, which I had never heard of. Lovely holidays to you all. Your Thanksgiving dinner looks amazing, wow! Looks delicious! I would not take the cheese too much to heart. I have failed numerous times - I still cannot make a bleu cheese worth eating. The good thing is, it really is just a bit of milk and some ingredients so it is always easy to do it again. Speaking of four-legged family members, I'm really happy to hear that it's working out great with the dogs. That must be such a relief. On your last post you mentioned that Pavlov's eyes are a bit close together and sometimes he looks cross-eyed...well, my younger daughter's cat is the same. She almost always looks cross-eyed and I think it's the most adorable thing in the world. It makes her that much more interesting. I pinned your apple and pear pie. I'm planning to make an apple pie soon and because I LOVE pears so much, I think adding them in will be awesome. Thanks for sharing it. Wok with Yan! Yes, I remember him. I never would have thought of him if you'd never mentioned it. It's been so long. This is what's fun about blogging friends. They share some really interesting things. Well, you know about my feelings about crappy cream cheese. Thankfully I've found an organic one that has great ingredients and an awesome taste. There are others but I can't think of them off the top of my head. So happy to see you guys had such a wonderful Thanksgiving !!!! A belated Happy Thanksgiving to you both! Oh my, but your feast looks to die for. Disappointing about the Colby; you need chickens to help you with the learning cheeses that don't make the grade! They never complain! It's good you're on the forum and can find answers. Interesting that so many people have trouble with that same recipe, is it the same one as in her book? I rarely use her recipes because I don't buy my cultures, but I keep it as my second cheese reference book. 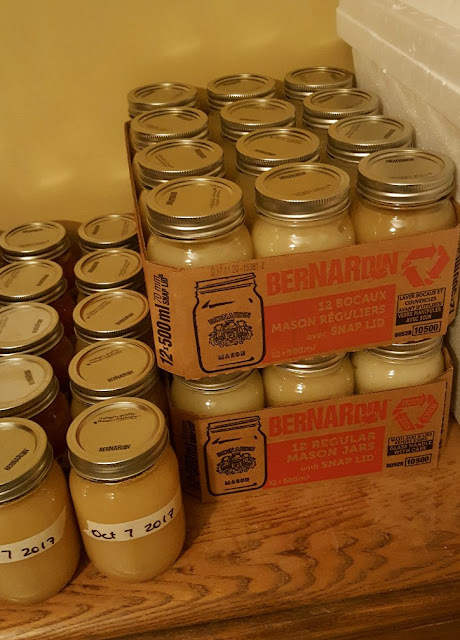 In fact, I pulled it out yesterday to look up her version of gjetost, because I wanted something besides ricotta to make from my growing collection of whey. Taste test this morning! 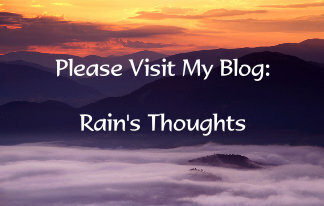 Blog report will be Saturday! What a lovely Thanksgiving spread and I love how you added the little pumpkins around your pie. My husband loves crust so that's a great idea for me to try. His only complaint with pumpkin pie is that there is too little crust. We had a chance to pick apples a month ago and I was just to tired with all the garden work around here. Now, looking at your applesauce I'm wishing that I would have gotten my rump in gear and went anyway. 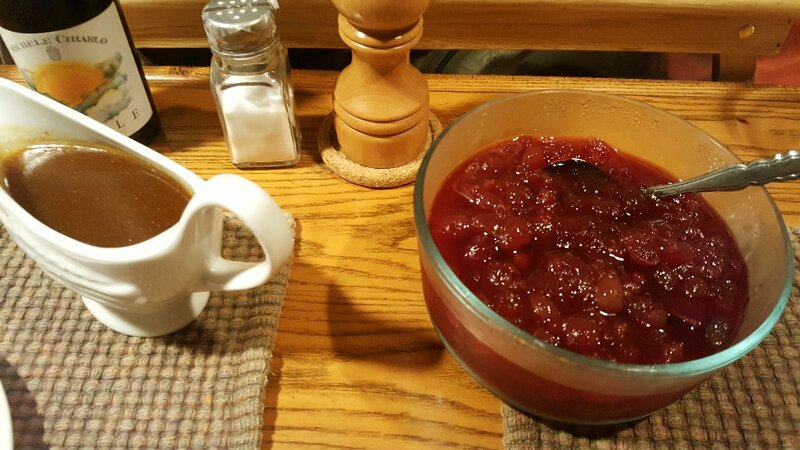 Your applesauce looks amazing. Happy Thanksgiving! Hi Tammie Lee :) Oh thank you! :))) We only heard of the cherry bounce from watching the show Moonshiners actually. It sounded like it could be good and I'm so glad we tried it! It's just a shame we have to wait until next summer to make more. The cherries need to be on sale for us to afford it!! Hi Martha :)) Thank you! :)) Lol about the dinner dates! 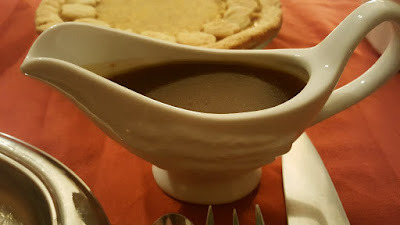 We had a repeat of the dinner last night and finished the pumpkin pie...stuffed again! I want to think of something different for the turkey tonight though before we get sick of eating it! The pears in the pie turned out really nice. Mine were so ripe that I had trouble peeling them and the flavours were super together! I hope you like it when you make it! Wok with Yan! He was so funny. I'm going to try to look up his tv show on You Tube or on one of the download sites. We have no Chinese-style restaurants in this area and we both used to love to get take-out. We've tried the frozen stuff...speaking of cardboard...so I really want to try to make it on my own. The book is very basic but it has all the classics in it! Yeah...that cream cheese...Philadelphia doesn't cut it anymore. I will be making my own from now on but it's a 2 day process so I have to plan ahead! Hi Snoskred :) Interesting about the pasta...I kind of get that way with white potatoes...maybe it's the starch, they make my heart race and I just don't feel good when I eat them. Hi Leigh :)) Thank you! :) Lol at the chickens...I used the recipe in her E-Book. When you join the New England newsletter email, they send you 2 free E-books with recipes. It's very similar to the one that they have posted online too. I have to look into this more because I know there are nuances...if it's bitter-tasting I should check X, if it's sour-tasting, I should check Y, if it's bland-tasting, I should check Z...I just don't know all of that yet. The cheese forum people are a real help though. I had to look up gjetost, I'll be interested to see how it works out!! Oh my, your dinner is making me drool! 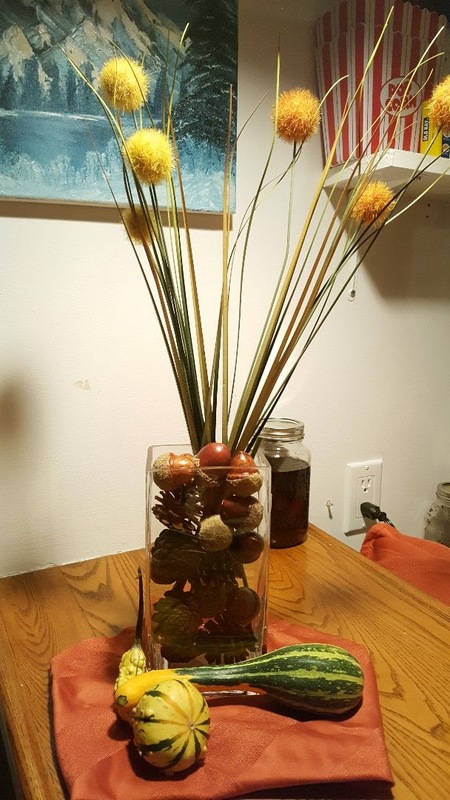 What a beautiful table you set too. I am definitely going to be looking for William Sonoma Thanksgiving cookbook...everything turned out great and tasted great... what more could you ask for from a cookbook? You did a beautiful job and you make everything so special! You both know how to truly enjoy the simple pleasures in life. I feel the same way, my 'girls', good food, some good t.v., handwork and great blogging friends....I am so blessed to have discovered 'the secret' to happiness and you guys have too! Enjoy the leftovers! Sorry Sam, here is a link that works! Amazing what you accomplished for your Thanksgiving celebration Rain - please send some your energy south! Thanks dear. The pies really turned out well, and they were delicious! Thanksgiving was really great this year, I'm so glad I tried a full turkey dinner!